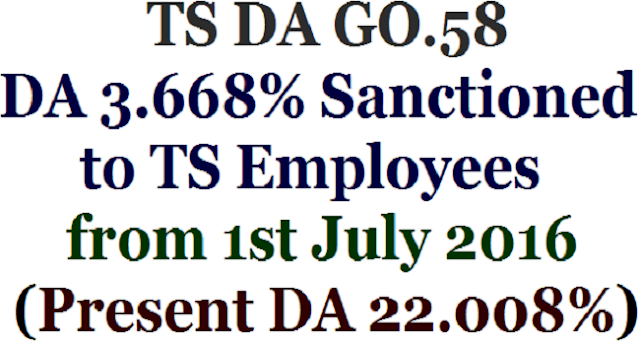 GO.58 DA 3.668% Sanctioned to TS Employees from 1st July 2016(Present DA 22.008%): TS #GO.58, Present DA 22.008%, #DA enhanced from 18.340% of the basic pay to 22.008% of basic pay from 1st of July, 2016, TS GO.58, Dt.20-04-2017, DA enhanced from 18.340% to 22.008% , Arrears :July 2016 to March 2017 to GPF, Cash from April, 2017, DA 3.668% enhanced from 18.340% to 22.008% from 1st of July, 2017. DA enhanced from 18.340% to 22.008%- #Present DA:22.008%: TS Government has sanctioned the Dearness Allowance (DA)(3.668%) to the employees of Government of Telangana State from 18.340% of the basic pay to 22.008% of basic pay from 1st of July, 2017. TS Govt enhanced DA to State Employees and Teachers. DA GO Ms No 58 Fin Dept dated: 20-04-2017 released. 2. Employees who are Governed by CPS 10% of DA from July 2016 to March 2017 shall be credited in to PRAN A/Cs. And remaining 90% of DA arrears shall be paid in cash. of the basic pay to 22.008% of basic pay from 1st of July, 2016. 01.09.2004 and are governed by the Contributory Pension Scheme (CPS), 10% of the Dearness Allowance arrears from 1st of July, 2016 to 31st of March, 2017 shall be credited to the PRAN accounts of the individuals along with the Government share as per the existing orders and the remaining 90% of Dearness Allowance arrears shall be paid in cash. the pay bills of the Office concerned for the month of May, 2017 unless a certificate is enclosed to the bills to the effect that the arrears of difference in Dearness Allowance for the period from 1st of July, 2016 to 31st of March, 2017, are drawn and credited to the General Provident Fund Account before 30th of May, 2017. 15th of June, 2017, and who in turn, shall furnish the consolidated information to Government by 30th of June, 2017. 1. Name of the Sub-Treasury/ District Treasury/Audit Officer. 2. The amount of arrears of D.A. credited to G.P.F. Accounts. 3. The amount of arrears of D.A. credited to Compulsory Savings Account. 4. Total amount of arrears of D.A. credited to the G.P.F. Accounts and credited to Compulsory Savings Account. 3. Name and designation of the employee. 5. The amount of arrears of D.A. so credited to G.P.F. Account/ Compulsory Savings Account.